Annapurna is a Sanskrit name meaning Goddess of the Harvests which aptly reflects the beautiful, verdant valleys and fertile terraced fields of this glorious trekking region of Nepal. With a variety of walking trails from gentle paths through the foothills to classic high mountain treks, the Annapurnas are justifiably one of the most popular and stunning trekking regions anywhere in the world. The Annapurna Massif is located in north-central Nepal roughly 200km to the west of Kathmandu. You can either fly or drive from Kathmandu to Pokhara. The drive takes about 6 hours whilst the flight time is only about half an hour. Pokhara is the gateway town for treks in the regions but is also a lovely, laid-back place to spend a day or two. Spring and autumn are the main seasons for trekking in the Annapurnas – from late March to the end of April and October to the end of November. Although trekking in the foothills is possible as early as February and as late as Christmas. Annapurna I, 8,091m, is the highest peak in the massif and is the tenth highest mountain in the world. It is also the only peak over 8,000m in the Annapurnas although there are thirteen peaks over 7,000m and sixteen more over 6,000m. One of the most notable mountains in the Annapurnas range is sacred Machhapuchare due to its beautiful ‘fishtail’ shaped summit. The entire massif and surrounding area are protected within the 7,629 square kilometres (2,946 sq mi) Annapurna Conservation Area, the first and largest conservation area in Nepal. The foothills of the Annapurnas are the heartlands of the Gurkhas, celebrated for their brave military service. It is still considered an honour for young men in the Annapurnas to be selected to join the British military whilst many others join the Indian Army. When their service is finished a lot of ex-soldiers retire back to their village homes and are greatly revered by their family and communities. The majority of the local people however are farmers due to the fertile nature of the region. Walking paths in the lower foothills and valleys of the Annapurnas often pass through terraced fields and farming communities where traditional methods are still in use. A superb trek through a verdant rural landscape, between a group of high quality lodges set against a backdrop of some of the highest and most beautiful mountains in the Himalaya. With its relatively low altitude and short duration, a trek into the breathtaking mountain amphitheatre of the Sanctuary is the perfect first Himalayan trekking experience. This classic trek stays in tea houses but we also offer Annapurna Base Camp in Style, that uses the best lodges en route. 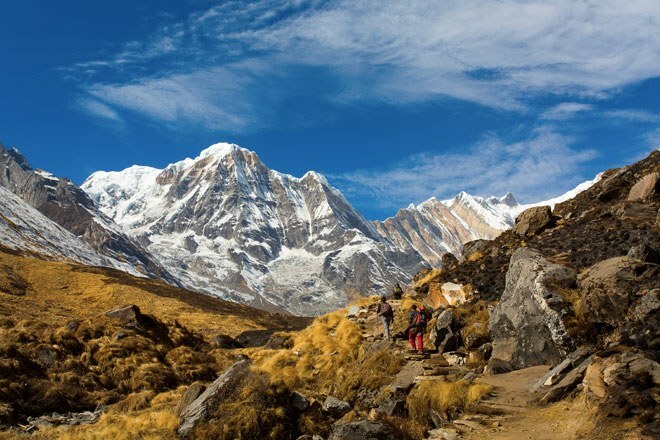 A truly world class trek that circumnavigates the entire Annapurna Massif taking your from terraced foothills to dramatic, high passes and into the world’s deepest gorge. If you have less time to spare, the Mini Annapurna Circuit still offers sensational views and excellent acclimatisation. Bordering Tibet, this remote and challenging trek crosses two high passes and explores little visited valleys and isolated communities to complete a satisfying traverse of the Annapurna mountains. In the heart of the Annapurna mountains, close to the Annapurna Circuit, this little-known route offers the same breathtaking landscapes but with the added bonus of few other trekkers. Not only a great trek at relatively low altitudes, the Mohare Danda Community Lodge Trek also gives you a genuine insight into life in the Annapurnas. You stay in locally owned community lodges and homestays - spending time with the local people and giving back to their communities by providing much needed, sustainable income. Read our Trekking Guide to the Everest Region. Read our Trekking Guide to Wild Nepal.